Just to say, BCS tractor is one fine piece of equipment. Totally happy with purchase. But more than the equipment was the service we received from Shahar, and a couple of months later when we purchased the tractor from John and Rachel. Everyone was such a pleasure to deal with. Will definitely be back. Highly recommend. 5 star. I enjoyed meeting you and your family when I came to pick up my BCS equipment. I appreciate that you took the time to go over the equipment and how to operate it. It can be hard to find quality equipment and quality people, but I’ve found both at Homestead Maintenance. I look forward to working together in the future—I’ll be back. My wife and I recently visited Homestead Maintenance to evaluate the BCS tractor and implements before purchasing. Not only were we greatly impressed with the equipment, but our experience with Shahar was outstanding. He spent a great deal of time with us answering our questions, demonstrating the BCS products and educating us in their usage. He even invited us into his home and took extra steps to provide for our comfort. The whole process was exceptionally delightful. I look forward to working with Shahar in the future when it comes time to buy additional implements that we may need in the future. I received my equipment at the terminal in Birmingham yesterday. I want to thank you guys for such a pleasant experience with both transactions that we have made. Your professional manner of doing business has been greatly appreciated. We have been so impressed with Texas BCS and highly recommend their company to purchase from. They were easy to work with and made the purchase process simple. We were able to get an extensive lesson from Shahar on how to use the equipment and he made sure we were comfortable with it before we left. They have excellent customer service and are responsive and helpful when we have had questions. The store location is in a beautiful part of Waco and the Homestead village is so fun to walk around. Go visit them today! We recently purchased a BCS tractor and implements from Shahar Yarden of Homestead Equipment in Waco, Texas. We are sustainable organic market farmers and were unaware that such a product existed until Mr. Yarden introduced us to the equipment. He was very knowledgeable about the product and did not try and oversell us, but rather helped us purchase exactly the model and accessories we needed for how we farm. We couldn’t be happier with our purchase and appreciate Mr. Yarden’s knowledge and expertise. He even took time to give us a thorough demonstration of how to use the equipment when we made our purchase. Our favorite implement is the Swivel Rotary Plow. It is amazing how quickly we can build our raised beds now. It is a time and money saver, and is a must for all market farmers. 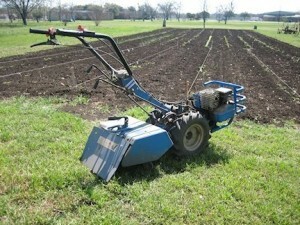 We have already recommended the BCS tractor, and Mr. Yarden as the best source to purchase one. The team at Texas BCS went beyond expectations in every way. They answered all my questions so knowledgeably that they gave me assurance that I was making the right decision for my farm before I even got my tractor. But my BCS 853 has exceeded my expectations even more! Every implement is so well designed and so well fit to my vegetable farm and I am amazed at its versatility and power every time I use it. It’s so simple to use, extremely fuel efficient and I know I am building better soil in using it instead of a large riding tractor while feeding my community at the same time. I still look to Homestead BCS for all of my farm equipment needs and cannot recommend them heartily enough. I just wanted to mention to you my ongoing pleasant exchanges with you and your company in the last few months. I really appreciate the professional demeanor, the patient demonstration of the various attachments that are available for the BCS tillers, the assistance in securing financing for my purchase, and in fielding my multiple questions about the operation of the equipment. I found your courtesy to be exemplary. Thank you for a nice experience! From the initial phone conversation about BCS options to the final pick-up with custom training in-service, working with Shahar and his team at Texas BCS was above and beyond what one could expect. Shahar’s kindness and genuineness permeated every interaction and made the entire process highly fluid and enjoyable. We support Texas BCS with the deepest of recommendations. Thank you so much for your professional service and attention to details on my purchase of the BCS 853 two wheel tractor. This thing is rock solid and worth every penny. This tractor is in a league of its own, and your staff there are wonderful folks. Thanks for taking the extra time to put me through a mini school on the operation of this tractor. This alone made this sale a five star deal. Shahar is a great sales person and made sure that when I completed this transaction that I had covered all the items that I might need in the future to round this tractor off — nothing short of complete happiness. I love this tractor and hope to show others how this tool can help them out. Thanks again for all of your help. I am one Happy Camper! Period! I would like to say a few words about my visit last week. 1st, I was fully expecting to drop my tiller off for service and come back the following week to pick it up. I was completely surprised and pleased that you took the time out of your busy schedule to complete the maintenance on my BCS tiller thus saving me an 11 hour road trip. 2nd the hospitality shown to me by your wonderful family shows the attention to detail that a business requires but few display. I would also like to thank you for taking your time to show a “city” boy the ropes and demonstrate my new tiller. Your knowledge of the tiller is invaluable. 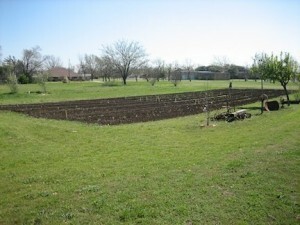 The day after I got home to Alexandria, LA I tilled and planted my 3/4 acre garden and it is well on its way to producing a bounty of vegetables to include corn, tomatoes, cantaloupes, water melons, broccoli, cauliflower, purple hull peas, potatoes, cucumbers, radishes, onions, and many more. Again thank you and I am looking forward to our next visit to the Waco area. My wife and I enjoy visiting Homestead to purchase our BCS tractor and accessories. We make a day of visiting the other shops and just enjoying the facilities at Homestead, as well as having lunch at the restaurant. The highlight of the trip is visiting with you and your family. Everyone is very gracious. Your hospitality makes us feel as a member of the family. We don’t always get that while shopping in Houston; it makes a huge difference. As you know, last year we purchased the 853 Tractor, 30″ Tiller, Rotary Plow, and Chipper. We use them to produce our fall garden, and our spring garden. All attachments have worked ideally with no complications. We are working on getting more production out of the backyard garden, and my only disappointment is I don’t have a bigger yard. I know with the BCS tractor I could work a lot more space with ease. Diane enjoyed showing everyone pictures of our garden. Let me know what you think, and as always suggestions are always welcome. 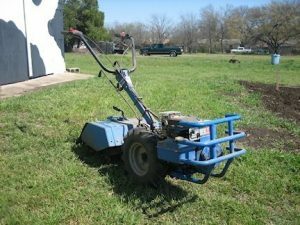 I just got a BCS 722 tiller. 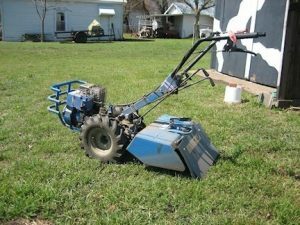 It is a very good tiller; it works very well in my black clay soil. Where I live there is about 2 feet of black clay then 20 to 30 feet of yellow clay; if you run into a rock it was left there by someone. The black clay has to be one of the hardest soils to work; when it rains there is no bottom; when dry it is as hard as concrete. With a tiller you have to start while the soil is still soft and a little wet. There are people that say that you can not kill turf grasses with a tiller; I am here to tell you yes you can. The best way that I have found is to start when the soil still soft. Till down to only about 3 inches, just deep enough to kill the roots of the grasses; this will apply even in sandy soil. You want to kill the grasses. If anything is alive all you will do spread the grasses. Keep the depth at 3 inches and till again at least a day apart for a few days; the more times you till the better. After the first pass it will be easy the next time. Then till to the depth you like. The BCS 722 has enough power to work my black clay soil. The BCS is by far the best tiller I have ever used. Thanks Shahar for your service; keep up the good work. Recently, I received an email message from someone who wanted to know the age of his BCS Tiller. It turned out to be about 30 years old, and is still working well. We met this morning (3/29/2014) at the Lawn & Garden Expo in Waxahachie. Below are some photos of my 20(+) year old BCS Tiller, which is still functioning quite well. I do not know exactly how old this machine is. I inherited it from my father and have been using it for the past 11 years. Other than changing the oil and inflating the tires from time to time, it needs no maintenance. Possibly you could tell me how old this machine is. Mark later emailed me the following update. We met here in Waxahachie at the Ellis County Garden Expo and I sent you some photos of my aged BCS tiller. Since then I have learned, from a neighbor, my father did in fact purchase the tiller new here in town approximately 30 years ago. I do not know from whom he bought it, but the neighbor is a reliable source for information of this nature. 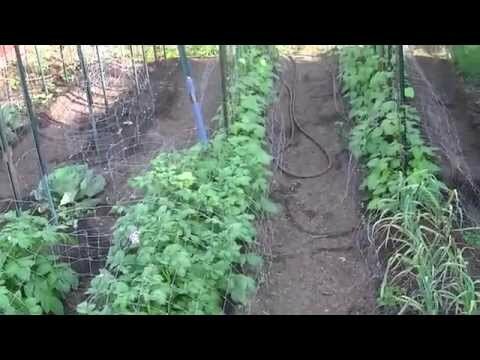 Below are some Mark’s photos of his garden and his BCS tiller. Just the briefest of notes to tell you how pleased we are with the Honda-powered BCS 853. When you and the manufacturer say there is no machine in the world quite like it, it is not an exaggeration. The rototiller sliced right through the surface vegetation and powered it back into the earth on the first pass. Amazing! Never got bogged down and, though relatively heavy, the BCS 853 was well balanced and easy to control. I have used the biggest Troy-Bilt rototiller many times in all types of soil conditions but the BCS 853 has it beat hands down! And we haven’t even had a chance yet to use our other two, soil-working implements: the Berta Swivel Rotary Plow and the Dozer Blade. You know we’ll be back for the Chipper/Shredder, Road Sweeper and a Heavy-duty Lawn Mower. One power unit, so many different applications year-round. Great combination. Once again, I would like to thank you for recommending Homestead Maintenance to handle my purchase of the BCS 853 tractor. I am delighted to inform you, that Mr. Shahar Yarden of Homestead proved to be a very knowledgeable, helpful and professional vendor, who assisted me diligently with all aspects of the purchase and with the exportation of the equipment to Mexico…. certainly, often beyond the call of duty. The equipment has arrived yesterday, in good order, and now I’ll have the fun to learn how to use it. I’ll be happy to give you my feedback on the performance of the machinery once I get my “tractor legs”. I would recommend Mr. Yarden not only to all of your Texas buyers, but also for any Central or South American sales. For me, this has been a very pleasant experience with no hitches. Something we (people outside of the USA) fully appreciate.